You may remember a little while back I posted a Mini Lush Haul (HERE) and within that haul was some newly formulated products from Lush's original line and some new products that have previously only been available in the Lush Oxford Street store. I excitedly picked up a few to try and one I couldn't wait to pop in my bath was the Rose Jam Bubbleroon. 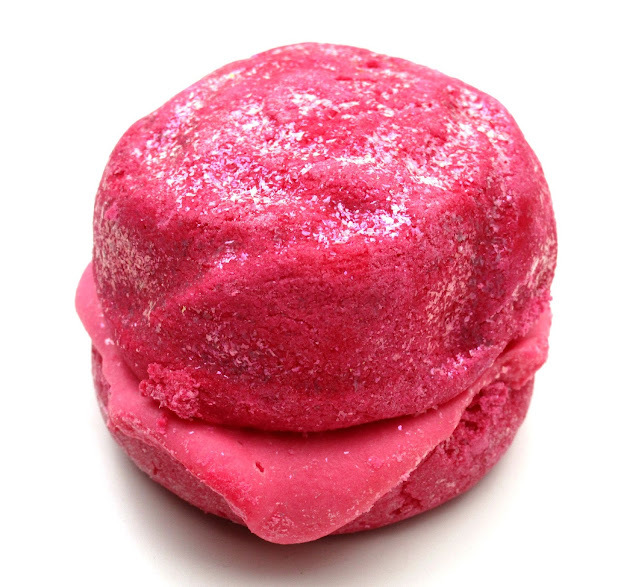 The Lush Rose Jam Bubbleroon (£3.75) has recently been given a makeover, instead of resembling a deformed marshmallow like it used to it's now larger in size and looks like a princess-inspired macaroon with it's hot pink colouring and duo-chrome pink and purple glitter dusting on top, ohhh it's just so pretty. 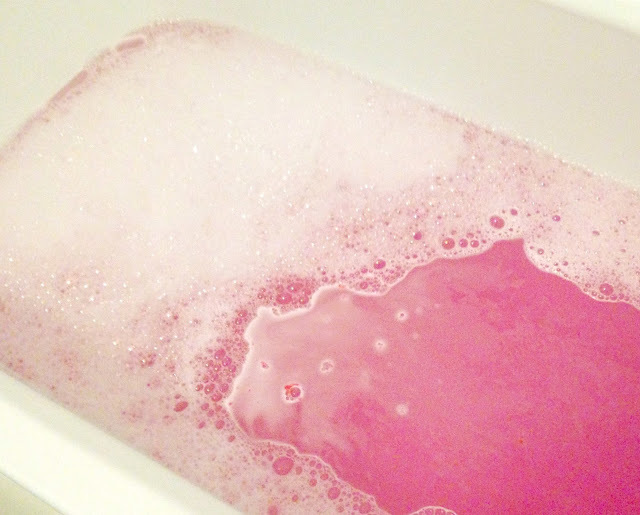 The Rose Jam Bubbleroon comes with two bubble bar halves that are cemented together with a creamy filling of coconut oil, the fact that it is a bubble bar means you can get quite a few baths out of it just by breaking pieces off and crumbling it into your bath water until you get your desired amount of bubbles, I actually got four baths out of mine because I used it in quarters. As for the Rose Jam scent... It smells incredible, it contains Rose oil and rose absolute which give a double dose of rosiness, theres also some lemon oil within which adds a slight kick and really helps perk you up and theres also a real jammy sweetness to it as well which I love, it honestly smells incredible. As I said before Rose Jam has coconut oil within the middle but as well as that it also contains fair trade cocoa butter too which if your a dry skin sufferer like myself your going to love, its so moisturising and leaves my skin felling so soft and nourished afterwards, its so lovely especially at this colder time of year. Overall I did really enjoy the Rose Jam Bubbleroon, its cute to look at, smells amazing, creates lots of bubbles and pretty pink water and nourishes my skin. Their are also two other bubbleroons within the bubbleroon collection which im now eager to try after loving Rose Jam so much! Have your tried the new reformulated Rose Jam Bubbleroon yet beaut's?? What did you think? ?